Two years after Django (1966), Sergio Corbucci returned to the Western with an even stranger, bleaker story about the uneasy compact between lawmen and bounty hunters. Up on the conductor’s podium this time was Bruno Nicolai and the name on the score was Ennio Morricone, the pair made famous for their work on Sergio Leone’s Dollars trilogy, which had culminated in the same year Django was released. 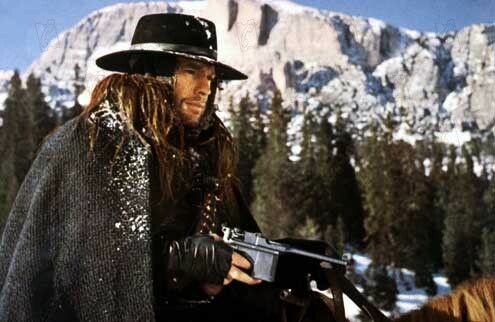 Corbucci was an old friend of Leone’s and shared his fondness for big zooms, bigger close-ups, and plenty of bright crimson, but the film is distinguished by its hazy, snowbound Utah setting, and its more explicitly radical politics (Corbucci was a communist, and apparently hated hippies). Morricone likewise takes a different tack. Eschewing the soaring heroic melodies and pounding horse-hoof rhythms of the Leone films, the music looks forward to his horror soundtracks of the 1970s. The cascading pitched percussion and pealing guitar notes anticipate Florian Fricke’s music for Werner Herzog (especially Heart of Glass) while at other points atonal woodwind motifs align Morricone with modernist composers such as Luciano Berio and Pierre Boulez. Since the great violin concertos of the late classical era, the interplay between a solo string instrument and an orchestra has stood in for the conflict between the individual and society, and Morricone’s music here works in the same way. The film’s hero, played by Jean-Louis Trintignant, is a mute killer with a childhood vendetta against bounty hunters. He is known simply as ‘Silence’ because ‘wherever he goes, the silence of death follows’. Ironically, he is the only character in the film to have his own Wagnerian leitmotif. Upon each entrance, he is accompanied by a solo string instrument playing the interval of a fifth. When we see through his eyes and flash back to his childhood memory, the leap of a fifth is taken over by flutes, and as his father is killed before his eyes, the harmonisation turns gratingly discordant. A decade and a half after John Cage’s 4’33”, even silence has its own distinctive melody.